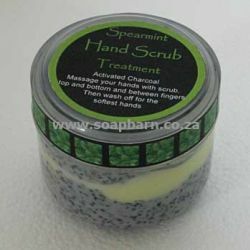 INGREDIENTS: 100ml Avocado Oil, 100ml Avocado Butter, 100ml Emulsifying Wax, 400ml Water, 100ml Urea, 8ml Euxyl, Spearmint fragrance, Coarse Activated Charcoal, 5 x 125ml Lotion Jars, METHOD: Over very low heat melt the emulsifying wax and the avocado butter. Melt it at the lowest possible temperature and as soon as it's melted remove it from the stove. Now mix in your avocado oil. Dissolve your urea in the water. Once the oils are mixed, tablespoon by tablespoon add your water while stirring. In the beginning it won't look too good - sort of curdled. But it's fine so don't panic. Add in all your water and stir until it becomes creamy looking. Add your preservative and mix it through well. Beat it with a small electric hand beater till you have a thick, smooth and creamy texture. Now add your spearmint fragrance or essential oil. As much or as little as you like. Add 100ml – 200ml coarse activated charcoal to the mixture so it is rough and textured. Now you can decant your mixture into lotion jars.